RJC Yacht Sales & Charter announces the sale of SALACIA, 115' Broward CMY! RJC Yachts Sales is pleased to announce the in-house sale and closing today of our 115' 1997 Broward CMY, SALACIA! Bob Cury represented the buyer and Raymond Young represented the sellers. 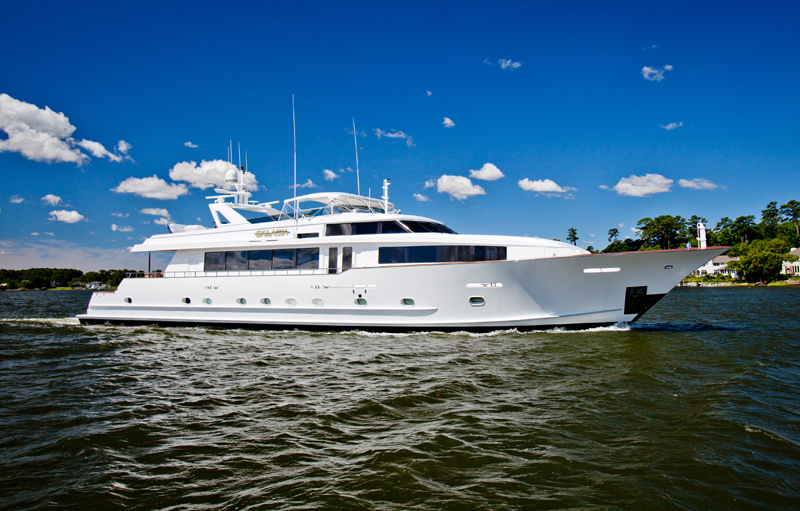 SALACIA represented one of the most highly customized 24' beam Broward's ever built and features full walk-around decks. Having gone through a total refit, she featured a new contemporary interior with all new soft goods, restyled flybridge with Jacuzzi, wet bar and new teak decks. She accommodates eight guests in a four stateroom layout along with crew quarters for four. Powered by Detroit 16V92's, she cruises comfortably at 16 knots with 20 knot top end speed. Her 9000 gallon fuel capacity provides for extended range of 2500 miles at displacement speeds. Additional options include Northern Light generators, 2000 GPD watermaker, Naiad stabilizers, 18' tender and (2) Yamaha waverunners. The yacht will be renamed TRUE BLUE and join RJC Yachts charter fleet out of Florida and Bahamas.